The nation’s most reliable source for affordable construction trailers and mobile offices. What Are The Benefits Of A New Construction Trailer? If you’re performing a major construction project, you need a lot of things. You need to hire the right workers, you need to get the right material lined up, and you may also want to consider a construction trailer. People often dismiss the benefits of a construction trailer. These are small metal buildings that rest on wheels. 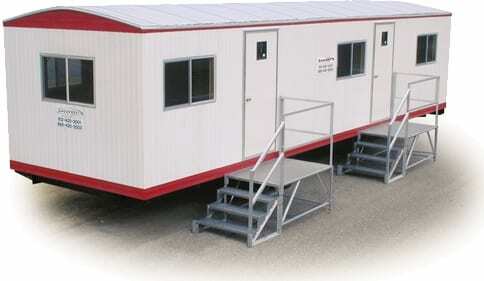 Much like a mobile home, but construction trailers generally have only one or possibly two rooms. They’re designed to be temporary on-site offices for the foreman and a centralized place to keep plans and paperwork. People often argue whether it’s better to buy or rent a new or used construction trailer. If you’re trying to get repeat business, then it benefits you to get a new one. It will hold up to the elements better, and give you a more secure location for office work. But should you buy or rent? That depends on how often you perform major construction work. Many smaller construction jobs, such as smaller homes or remodeling jobs, can be done without the need of a centralized office. If you perform smaller construction jobs more often, then renting one is likely better. If you perform major construction projects often, then you should buy one. It’s better to own it than to pay money every time you use it. There are a variety of customizations, as well. There are trailers that are little more than rectangular metal rooms, and trailers that are nearly mobile homes in their own right! If you feel as though you may need to be on-site day or night, a fancier trailer with space for a cot may be a great idea. If you just need a spot to keep paperwork and spread out plans, then you probably only need a small one. If you’re a professional construction company, then you simply need to get a new construction trailer. There’s no other option if you want to be professional. Used construction trailers have become a new phenomenon among experts because of the value on offer.Here is a look at what this option is all about. This is the primary benefit. You are getting a great deal at a great price. It is going to stay as affordable as you want it to be and that is what matters. You will feel secure with the purchase. You are going to gain access to better brands and better features by going down the “used” route. Most of these bigger brands are priced high, and you don’t want to pay such an exorbitant amount when you don’t have to. Think of it like buying a car. You don’t want an asset at its full price because this is going to bite into your value. You will want to let others deal with the depreciation and take advantage of the reduced price. You will be looking at setting up a new office in a remote area, and this is going to do wonders. This is the reason it is used by construction agencies. You will be able to tap into this value as well with your business. The second use comes in the form of storage in a remote location. You want to protect those items, and a simple trailer will do in such cases. There are various used options on the market under a plethora of brands. Multiple companies sell these trailers under their “used” section, and many add them to online marketplaces for selling purposes. Going through these marketplaces is important. These are just some of the amenities one will see with these trailers. A person can customize the trailer to include additional bedrooms (i.e. jack and jill) or add in a proper washer/dryer combination. You can also include things such as ladder racks, rubber coin flooring, translucent roofing, and integrated latter (rear door). This is just the beginning of your options. If you are a supervisor, manager, or owner of a construction company, then you know some job sites wind up being such massive affairs that you need an office of sorts at the location where the work is being done. Some businesses choose to keep their own construction trailers, but there are advantages to using construction trailer rentals. The need for a construction trailer should be obvious. It gives leadership and organizational staff a clean, dry, place protected from the elements to handle blueprints, work on computers, take phone calls, and have meetings. With the right power and utility hook-ups, you can even give your outside construction personnel a space to pack lunches, take breaks out of the elements, and possibly even use bathroom facilities a step above portable units. If you owned your own construction trailer, you’d have a few burdens to deal with. The first would be having some place to store it when not in use. The second would be transporting the thing when it’s needed or when the job is done. You don’t have to do any of that with a rental. The provider should handle the transportation to the job site when you need one placed, and they should also come pick it up when you’re done with it. That spares you both transportation costs and storage space. Another advantage to this is that if a project runs over or another one starts early, and you need another construction trailer before you’re done with one you’re still using, then you just call for a second one. You use both for a while at the same time and return the first one when you’re done with it, provided your provider has multiple units at one time that you can rent out. Finding construction trailers for sale isn’t exactly rocket science. All you need is a fast internet connection and a computer, smartphone or whatever kind of mobile device you want, and you’re all set. You can search for used construction trailers in Google or in your favorite search engine, and see what kind of results you get. Most probably, you’re going to find some listings that belong to big classifieds websites. By clicking on any of them, you’ll land on that particular website which contains hundreds of potentially interesting listings. You can browse through the “constructions” or “trailers” category, and make a note of all listings that appear to match your needs. As such websites offer users the possibility to apply various filters, you may want to narrow down your search by entering a few criteria such as the size and the weight of the trailer. If modern technology isn’t your cup of tea, you can always buy your local newspaper and take a look into the classifieds section. However, you may not be able to find anything of interest, because most people use the internet to list things they no longer need, and want to sell. Alternatively, you can contact some builders in your area and ask them whether they have some old equipment for sale. The major drawback to this approach is the hours of time you will need to spend searching, browsing, filtering, and eliminating the options that don’t quite fit your needs. Why not skip all that hassle and get exactly what you need with competitive, FREE, no-obligation quotes on trailers that meet your custom requirements exactly? Take 30 seconds and get quotes fast! The steel storage container is a viable option for many business owners and is well-regarded as being the way to go. Let’s take a look at what the container has to offer. It can take a pounding when it comes to rain, snow, and other weather. It is not going to break down nor is it going to let the assets inside get ruined along the way. What is the primary goal of a container? It has to protect and store key assets the business has under control. If that is the case, security will always matter, and that is what the steel storage container brings to the table. It is one of the safest options on the market. For a business owner, efficiency is the name of the game. A steel storage container can optimize the process and ensure transferring of assets is as easy as it gets. This is critical for the business and its bottom line. The options are endless, and it always depends on what the business has in mind with the steel storage container. Extreme weather can cause problems as the temperatures might get through the steel storage container. This is often the case in hot deserts or cold arctic conditions. Regulations in certain regions are particular when it comes to storage containers such as these. It’s important to keep them in mind! Key features include weather resistant, convenient, fork pockets (forklift accessible), seamless, and blends easily into the setting. According to recent studies, a business can save 20% over time in comparison to other solutions. This is considerable as it starts to add up in a hurry. For example, for every $1000 being earned, the business gets to keep an additional $200 in its pocket due to the steel storage container. US Construction Trailers offers price quotes in all 50-states and can include new or used mobile office trailers and can assist with renting or buying options. We have major affiliates with locations in New York, Los Angeles, Chicago, Houston, Philadelphia, San Antonio, and San Diego.